Grilling is a great way to prepare vegetables. From the old familiar corn on the cob to mushrooms and tomatoes. Below are some guidelines to make sure your vegetable grilling experience is a good one. Cut in half or into thick slices. You want it to stay on the grill and not fall through into the fire. Thicker vegetables should be cut into approximately 1/2 thick slices. Smaller vegetables can be skewered for easy grilling. Brush vegetables lightly with butter or oil. A sprinkle of salt couldn't hurt. On medium hot grill place skewered and larger vegetables directly on grill grate. Grill baskets are also an excellent way to obtain a great grilled flavor with out loosing then into the fire. Turn vegetables frequently to grill evenly and brush with additional butter or oil to prevent drying, if necessary. When the skin is slightly blistered and the vegetables become slightly soft season with salt and pepper and remove from grill. 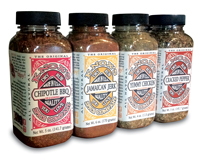 For a traditionally spicy flavor brush vegetables with oil infused with our traditional Jamaican Jerk Dry Rub. In a small bowl combine 1/2 cup cooking oil, 1 Tablespoon lemon juice and about 1 Tablespoon of Knox's Jamaican Jerk Dry Rub. Brush on vegetables while grilling. Corn on the cob will never be the same. Grilled or boiled corn brushed with Chipotle BBQ seasoned butter is a little slice of heaven. Just whip together 1 stick of soft butter with 1 Tablespoon Knox's Chipotle BBQ dry rub. Let stand for 10 minutes. Brush on grilled or boiled corn on the cob before eating.